What is Liposonix Treatment ? Liposonix is one of the latest, non-surgical, non-invasive fat reduction technologies. Using state of the art, intense high frequency ultrasound (HIFU), destroys fat cells in a procedure lasting between 30 to 60 minutes. After a single treatment, a reduction in one dress size may be achieved with permanent fat reduction. With minimal downtime after the procedure one can return to the normal daily activities the same day as the treatment. Over the following 8 to 12 weeks the body naturally processes and permanently removes the destroyed fat cells. A specially designed treatment head is placed over the chosen treatment area. 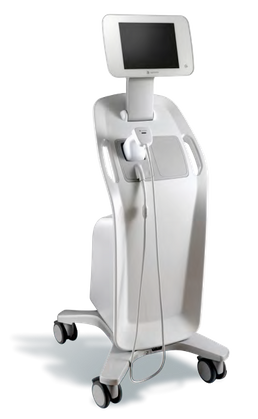 This treatment head delivers high intensity focused ultrasound energy to approximately 1.3 cm below the skin in order to target the desired area of subcutaneous (below the skin) fat. Fat beneath the surface is destroyed due to an effect called thermal coagulation caused by the high intensity ultrasound. The energy delivered by the treatment head heats up the layer of fat below the skin to more than 56°C causing the fat cells to be destroyed without harming the layer of skin above. The treated fat tissue gets removed through the body's natural elimination process. The treated fat cells break down and will be eliminated by the body naturally over the following 8-12 weeks leaving you with a thinner, more contoured waistline. Immediately after your treatment you may experience some minor discomfort, redness and swelling, this should subside within a few hours following the treatment. Over the next 8 to 12 weeks your body will naturally process the destroyed fat cells and remove them from your body. In doing so, your treated area will become naturally slimmer. Results achieved with this procedure can be permanent as long as a sensible diet and exercise is maintained to avoid future weight gain. Top-up or maintenance treatments can be done in the future to give you an extra bit of fat reduction but additional treatments are not recommended for at least 6 months after the initial treatment. Unlike many other fat reduction procedures that require multiple treatments to see results, the Liposonix treatment can reduce your waistline by an average of 1 inch (about one dress size) after a single, hour long treatment. This cost effective procedure will help you shift that last bit of stubborn fat that you’ve been trying to lose after a single session. Individual results may vary, but results are typically seen between 8 to 12 weeks following the procedure. The Liposonix procedure is a non-invasive, safe treatment with clients usually able to resume their normal daily activities immediately after the procedure. More than 10 years of research have been completed on the Liposonix system, including international multicenter clinical studies. No serious or unanticipated adverse events related to the treatment have been observed or reported in the clinical studies of the Liposonix system. Unlike invasive fat reduction procedures such as liposuction that carry surgical risks and require a significant post-surgery recovery downtime, Liposonix is not invasive and non-surgical and so does not carry these risks. Immediately after the treatment you may experience some minor discomfort, redness and swelling, this should subside within a few hours following the procedure. Which areas of the body can be treated ? If you are close to your ideal size and are looking to get rid of that last bit of stubborn, unwanted fat around your waistline then Liposonix may be for you. The Liposonix treatment has been designed to target the abdomen (both the tummy and waist), the thighs including “saddle bags” and the back for those stubborn “love handles”. Areas suitable for treatment are those that you are able to pinch an inch (2.5 cm) of fat. Anyone undergoing Liposonix should have a body mass index of equal to or less than 30 in order to achieve up to 1 inch fat reduction. It is not a treatment for obesity or a weight loss cure. Liposonix is not for everyone. It is not recommended for anyone who is pregnant, may be pregnant or is lactating/ breastfeeding. You should not undergo the Liposonix treatment if you have an existing hernia in the area to be treated or if your BMI exceeds 30 (classified clinically as obese). The treatment is not advised for anyone with a clotting disorder, using anticoagulants or platelet inhibitors or for anyone who has an implanted electrical device such as a pacemaker. The treatment is also not recommended for people with cancer or systemic disease. On average each treatment takes an hour. This varies depending on the area you are treating or whether you are interested in treating several areas on the same day. During the consultation, the areas to be treated will be evaluated and thus calculate the required treatment time. The procedure itself is associated with some discomfort but is tolerable. As such, no anaesthesia is required. During the Liposonix treatment you may experience, prickling, cold, tingling, a warm sensation, discomfort or pain. If at any time it becomes too much for you rest assured that your practitioner will pause the treatment and continue when you are ready. Our aesthetic practitioners are fully trained to deliver the treatment in a way that minimises any discomfort associated with the procedure. For example, between each individual application of the high intensity focused ultrasound energy, small pauses will be made and the head will be circulated within in the treatment area to reduce the discomfort. After the Liposonix treatment you may experience some bruising, soreness and swelling of the treated areas. You can resume normal activities immediately after the procedure. How can one apply for the treatment ? People interested in doing Liposonix treatment are to undergo a brief consultation to evaluate if the treatment is ideal or not. Once it will be concluded that the treatment is ideal for such a person, then another intense consultation is done during which, an ultrasound is done to verify the amount of fat thickness, check the BMI, and mark all areas to be treated. Photos of the marked treated areas will be taken and given to the client which then are to be presented to our aesthetician in order to perform the treatment as agreed.